Boys Basketball – The Boys Varsity Basketball team dropped their last game of the season 76-69 at Woodbridge. As a result the boys finished fourth in league and just missed out on making the CIF playoffs. Senior guard Kiron Dey who was the team’s leading scorer and rebounder was named to the First Team all-Pacific Coast League team while sophomore guard Kevin Yahampath who led the team in assists was named to the second team. This season the Trojans received major contributions from seniors Justin Wu and Tyler Cashman along with juniors Joe Christensen and Ryan Pham and sophomore Alex Bray. The coaching staff and the players would like to say a big “THANK YOU!” TO THE Trojan Army, the best fans in the PCL for all their support this season. What an exciting season. Great job boys. Girls Basketball – The Lady Trojan basketball finished up league play with a tough loss to cross town rival Woodbridge by a score of 42-38. The girls qualified for the playoffs and traveled to Katella for their first round game. Our girls battled Katella and pulled away late in the 4th quarter for the big win. Last Saturday our girls met up with Huntington Beach the #2 seed. HB got off to a hot start and led the game 10-0. Our girls did not give in and came back to make things interesting. Our girls were down 6 at halftime. The gym was rocking as we had a great turnout. (we sold more tickets than CIF game us) Huntington caught fire in the second half and pulled away to win the game. Congrats on such a great season girls. We would also like to congratulate the JV and Frosh/Soph girls basketball teams for not only being the league champions but going undefeated in league. Great job to our lower level teams….. the future looks very bright for UNI girls Basketball. Boys Soccer – Our boys finished off their season with an impressive 3-0 victory over Woodbridge. Ameen Beheshtaein recorded the shutout in goal. Goals were scored by Senior Riley Duncan (2) and Senior Bardia Movafagh. David Kim (2) and Sam Kelley supplied the assists. Stand outs on the season were Sam Kelley with 10 goals and 5 assists and also Riley Duncan with 6 goals and 6 assists. Congrats on a great season boys. Girls Soccer – The Lady Trojans rounded up the season with a dominant victory over Woodbridge, finishing 4-0. Ending the first half at 1-0, the team rode the wave of support from the boisterous crowd to play some beautiful football. Kiana Ghamari, and Sofya Ogunseitan added to Emma Goolsby’s two goals to secure the victory. Sofya and Paige Metayer each had a goal called back by the ref in the second half, adding to the strength the team showed. The win placed the team in third in league play, and sent them to the post-season. Our girls traveled to Vista Murrieta High School for the first round of CIF play last week. Our girls fell by a final of 6-2. Our girls had a great season and with several underclassman on the team this year the future look bright for UNI Girls Soccer. Girls Water polo – The girls water polo team wrapped up their winning season last Thursday at Woodbridge beating the Warriors 5-4. Down 3-1 going into the 4th quarter (and having already beaten WHS twice earlier in the season) the lady Trojans would not give up despite having Caitlyn Kissinger sitting out due to illness and the many disadvantages and obstacles the team has to face in visiting pools. Goalie Molly Hudash had a stellar game tending the cage. Anastasia Gomez, Chandler Denaro, Ali Huxman, Gauvri Nathwani, Angela Yan and Michela Boarnet kept the team composed with great efforts. Sophia Bajak scored to bring Uni within a goal…a few minutes later freshman Anna Campbell had her breakout performance of the season as she was positioned offensively outside 8 meters from the goal on the top left side with pressure swarming all around her, she took a pass with the shot clock winding down and took the shot to the upper right cross cage corner and scored to tie it up! A minute later, the exact scenario came about, and Anna delivered again to put UNI in the lead…although Woodbridge scored later to tie it up 4-4, the Trojans had enough confidence with a late surge to entrust the ball into the hands of their ringer, Shawna Kedzie who gave UNI the lead back with a cross cage lob shot from the right side. With 2 seconds remaining in the game both teams called multiple time outs to come up with strategies that would ultimately favor UNI. The Varsity team had 15 victories (most in 7 years) and 13 losses, second best record in league behind Corona del Mar…but losses to Beckman and Irvine hurt UNI’s playoff hopes. Shawna Kedzie lead the league in goals with about 90 scores, Molly Hudash was second in league with goalie saves with nearly 300 and Sophia Bajak lead the league in assists with almost 50. With a new discipline and shaping a culture we envision with UNI athletics…the girl’s water polo program WILL once again move up the county ranks. Great season girls! Wrestling –Lorena Egea (10) placed 5th in the Southern Section of CIF last weekend, which represents 570 high schools! Lorena will be competing this weekend in the state championships. Good Luck Lorena! Athletes with Character Banquet – Congratulations to Amir Javadi and Michelle Maddox for being recognized as the UNI male and female athlete of character. These student athletes represent everything that is right about high school athletics. They are stars on the field and they lead their teams with their leadership. Michelle starred as a captain on the tennis and soccer teams. Amir is a treat as he is a three sport athlete. Amir was on the football, wrestling, and lacrosse teams. Congratulations to these two stars. Players like them is what makes high school sports so special. 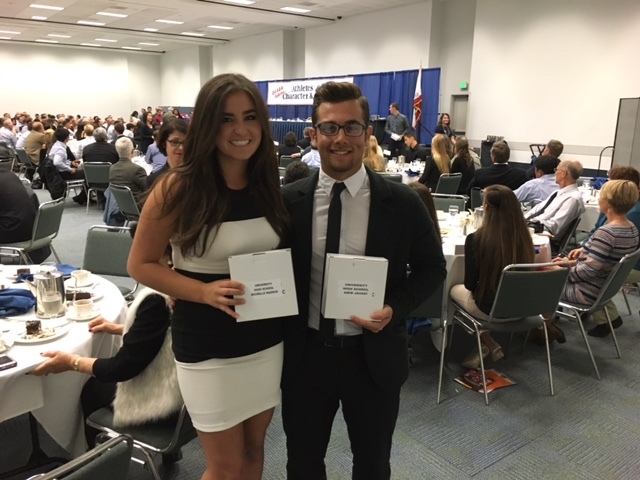 Below is a picture of the two at the banquet that was held on Monday night at the Anaheim Convention Center. Boys Basketball – On Senior Night the Boys Varsity Basketball team led from start to finish and defeated Irvine 96-74. Kiron Dey led the way with 29 points, nine rebounds and five steals. Justin Wu added 21 for the Trojans. Last Friday the boys dropped a tough one to Corona del Mar in a back and forth game. Kiron Dey scored 35 points to pace the Trojans. Tomorrow night the Trojans travel to Woodbridge to face the Warriors in the regular season finale. University won the first round contest between the two teams 74-61. We hope to see you there. Game time is 7:00 p.m. Girls Basketball – After a tough loss last Friday to CDM, the Lady Trojan Basketball team bounced back with a commanding win over Irvine 51-32. All scores were led by Laura Nolan with 17 points and 7 rebounds. Allison piper added 9 points, 7 rebounds and Yasmine Choroomi had 9 points and 9 rebounds. The Lady Trojans travel to Woodbridge tonight for a 5:30 game. We hope to see you there. Boys Soccer –Last Thursday our boys lost to CDM on a last minute goal. Our boys bounced back in a huge way with an impressive 7-0 victory on Tuesday over Irvine. Goals were scored by Riley Duncan, Faris Qaisi, Adam Eldefrawy, Bardia Movafagh, Sebastian Hertel 2, and Pedro Palmaka. The assists were handed out by Kevin Kwon, Riley Duncan, David Kim 2, and Sebastian Hertel 2. Our boys have senior day this afternoon at 3:15 in our stadium. Good Luck boys. Girls Soccer – The Lady Trojans suffered a heartbreaking 1-0 loss to Corona del Mar last Thursday. After playing a scoreless first half, CDM had a lucky strike that found the back of the net. Try as they might, the girls could simply not find a way to get on the scoresheet. However, they rebounded with a dominant 3-0 win over Irvine on Tuesday. It was the Game of the Week and Senior Night, so the girls were focused, determined, and played very well. A scuffle in front of the goal allowed Cameron Lopez to lay off an easy ball for Kiana Ghamari to tap home. An impressively powerful shot from Lauryn Wood from around 20 yards out secured the second. Lastly, a truly selfless play from Paige Metayer brought home the third goal: she was one on one against the goalie but saw Amanda Kutcher wide open on the far post and slid an inch perfect pass for Amanda to tap in. Beautiful football! A win tonight against Woodbridge closes league play and allows the possibility of advancing to CIF, so please come out and support! Our girls will be playing here at UNI at 6:00. Girls Water polo – Girls water polo team will play their last league game of the season today against Woodbridge, with a win the Trojans will finish with a winning record of 15 victories and passing up their totals from last season. The lady Trojans lost a nail biter last Tuesday at home to Irvine with a score of 6-7. Shawna Kedzie ranks #1 in league and top 10 in county with goals scored. Good Luck today girls! Wrestling – Trojan wrestling has qualified its first ever female wrestler for the Girls’ CIF individuals, Lorena Egea (10). Lorena will compete this weekend in Corona to qualify for the State meet later this month. Uni also qualified 8 boys to wrestle in Boys’ CIF Individuals: Joshua Gonzalez (12), Alejandro Madrid (12), Lado Dolidze (12), Connor Martino (12), Jordan Elam (11), Ibrahim Takesh (12), Alex Poordanesh (10), and Julian Poordanesh (10). The boys will compete in 2 weeks to qualify for the Masters of the Southern Section. Good Luck this weekend Larena! We started “Pack their Gym” 5 years ago and it has been a huge success. Tonight we are continuing the tradition as we will Pack the Woodbridge Gym for our big basketball games tonight. We are asking all student and parents to wear Columbia blue tonight. If you don’t have a UNI Basketball this is our House shirt we still have some available in the athletic office for only $5. Hope to see everyone out there tonight. Our Game of the Week (GOW) program has been a huge help to our athletic teams and the results prove it. In the fall our teams were 4-1 in their GOWs and during this winter season our teams were 5-1 in their GOWs. That puts us at 9-2 on the year. This goes to prove that getting fans out to games and creating a special atmosphere really does help out athletes. Thanks to everyone who has come out to support our teams at their GOWs. Boys Basketball – The Boys Varsity basketball team dropped two Pacific Coast league games this past week, 82-79 to Beckman last Thursday and 79-64 to league leading Northwood on Tuesday. Against Beckman the boys fought back from an early deficit to have a chance to win at the end but fell just short. Senior guard Kiron Dey scored 21 points to pace the Trojans while sophomore guard Kevin Yahampath had a double-double scoring 14 points and 11 assists. Tomorrow our boys travel to Corona del Mar for an important PCL contest. A win tomorrow will most likely put the Trojans in the CIF playoffs. In the first round UNI defeated the Sea Kings 89-85 in a double overtime thriller. The boys encourage the University community to come out and support our team tomorrow night at Corona del Mar. Game time is at 7:00 p.m. Girls Basketball – Last Week the Lady Trojan Basketball team finished off with defeating Beckman 57-43. Standout performance by the whole squad! Kaci Blailock let the Trojans with 14 points and Allison Piper and Malia Goldsmith both added 12 points. Tuesday the Lady Trojans fell to Northwood in a close game 45-47. In that game Allison piper led the team with 19 points and 10 rebounds. Please join us on Tuesday February 9th where we will honor our graduating senior players at 5:15pm before the game. Boys Soccer – Our boys fell to Beckman 3-1 last Thursday. Riley Duncan scored with an assist from Sam Kelley. On Tuesday our boys fell to Northwood by a final of 1-0. Our boys look to get back to their winning ways this afternoon as they host CDM at 3:15. Girls Soccer – The Lady Trojans had a fantastic match against Beckman last week, securing a 1-0 victory with a powerful shot by Lauryn Wood, for her first league goal as a Varsity player. The girls then ground out the victory withstanding some late pressure to hold on for the win. The team was hoping to carry the momentum from a three game winning streak into yesterday’s match against an unbeaten Northwood side, but ended up dropping that match 0-4. The girls played tough and generated a lot of offense but simply could not find the back of the net. The Girls Soccer program is sitting in third place in league play, and could very well end up securing a CIF berth for the first time in 4 years. Tomorrow they play CDM (away), but feel free to come out and support in what promises to be an exciting and very important match for the team! Good Luck Girls! Girls Water polo – UNI girls water polo team has 14 wins on the season which tied their max total from last year…with two more regular season games remaining…one more victory would be the highest for the program in 8 years. Last Tuesday Feb 2nd, the lady aqua Trojans drowned the Timberwolves of Northwood 10-5 in front of a home crowd at UNI pool with much needed game of the week support. Wed Feb 3rd UNI lost a league game at Corona del Mar H.S. Shawna Kedzie leads the league in scoring with 79 goals on the season so far…Molly Hudash has been incredible in the cage making save after save and Sophia Bajak has stepped up as a team leader assisting in all areas to help the team achieve its goals. With two more games remaing the UNI girls team needs to beat Irvine next Tuesday Feb 9th at UNI during senior day and secure a victory at Woodbridge Thurs Feb 11th to make it into the CIF playoffs. Wrestling – Congratulations to the following UNI wrestlers for making the CIF tournament. Lado Dolidze, Lorena Egea, Jordan Elam, Alejandro Madrid, Connor Martino , Alex Poordanesh, Julian Poordanesh, and Ibrahim Takesh.